Margaret Ritchie, South Down MP, hosted a visit to St Patrick’s Country from Theresa Villiers MP, Secretary of State for Northern Ireland. 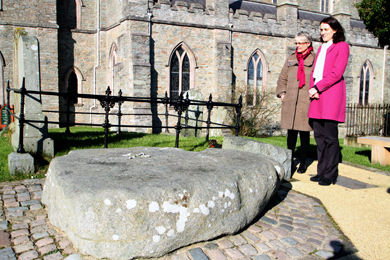 They are pictured at St Patrick’s Grave. SPEAKING after NI Secretary of State Theresa Villiers MP visited Downpatrick, which concentrated on the St Patrick sites and the early Christian heritage trail, Margaret Ritchie, MP for South Down, said: “I am very pleased that the Secretary of State accepted my invitation to visit South Down. On this visit, as we approach St Patrick’s Day, it was appropriate that the Secretary of State visit the main St Patrick sites and the St Patrick Tourism trail in Downpatrick and Lecale. During her visit the Secretary of State visited the St Patrick’s Centre, and met the Chairman of the Centre, John Carson. They then visited St Patrick’s Grave and Down Cathedral meeting Dean Henry Hull, and also went to Saul Church and Struell Wells. At each of the public sites, the Secretary of State saw how recent investment by the NIEA, NITB and Down Council had resulted in improvements for visitors. 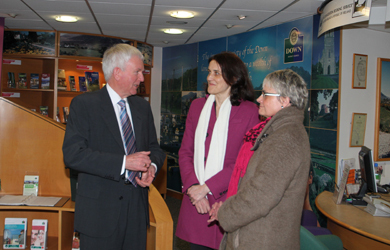 John Carson, Chairman of the St Patrick Centre in Downpatrick, in the Tourist Information Centre, chats to the Secretary of State Theresa Villiers MP and South Down MP Margaret Ritchie. In 2012 Margaret Ritchie launched a product development plan for St Patrick tourism for the Downpatrick area. It was assisted by Eddie McGrady, Michel McKernan and the late Peter Craig, Dr Brian Turner, members of the clergy and Down District Council and the St Patrick Centre. Ms Ritchie said that no other place in the world could claim to have such strong connections with St Patrick, and that there was huge tourism potential in St Patrick-related tourism. 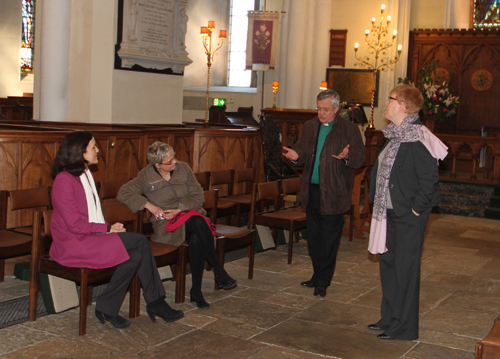 Theresa Villiers, NI Seceratary of State and South Down MP Margaret Ritchie with Dean Henry Hull and the Downpatrick Catherdral Church Warden, Joyce Wilkinson, talk about the history of the church.